Ever so gently, the Riverside Marina hoist lowered our Pearson 365 sailboat into the stands and blocks to stabilize it for its temporary stay “on the hard” for boat maintenance. It’s the third time we’ve hauled Journey for regular maintenance since we bought her, in 2012. 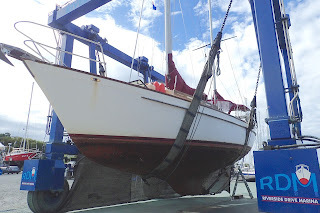 Journey, suspended in Riverside Marina's lift, for haul-out. before Journey left the water. the unwashed dark area to the left of his shoulder? Once aligned with the lift, Journey was suspended for her bath before getting moved to the stands for work. 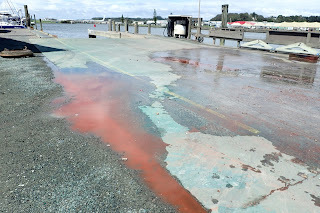 The concrete bled red from the pressure wash to remove marine scum from our hull. “Guess we’ll need 2 coats of anti-foul paint instead of just one,” Wayne surmised. Still, we were pleased post-pressure-wash, there wasn’t a lot of sanding still required to clean the hull before re-coating it with anti-foul paint. in the pressure wash along with the marine growth. she's resting on? That's what caught Wayne's attention. 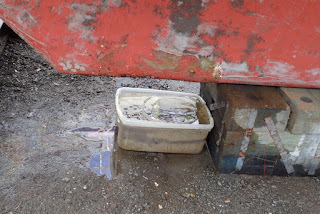 When Wayne pointed out the little stream of water running off the bottom of our boat as it was placed in the stands. I figured it was still just some drips from the water pressure wash. Fortunately Wayne was not only more observant, but also more astute about its potential cause. to come and assess what's needed. After much peering and conferring, it was determined a prior owner's fiberglass repair failed and would require a significant repair. 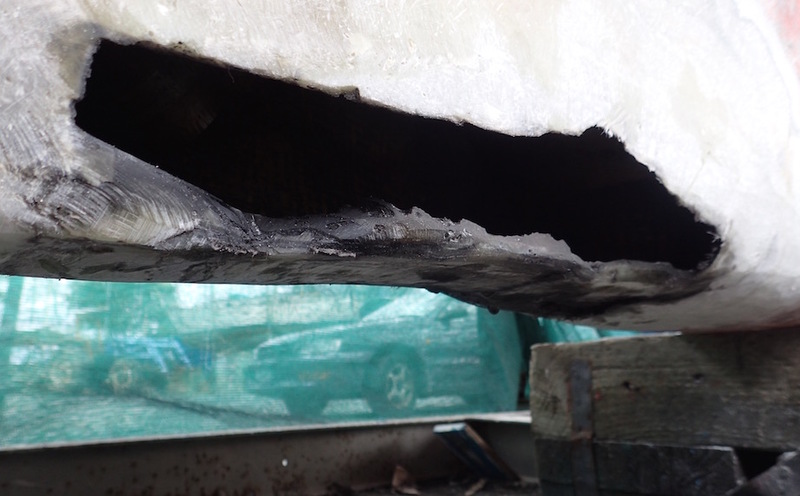 First the faulty repair needed to be removed, the full cause for any contributing failures assessed and addressed. "Your boat is special," commented Karl, Riverside Marina's yard manager. "Is that what you call a boat when you really want to call it something else [more profane]?" I countered. "You could say that," he replied. The diplomatic corp could use a lad like Karl. 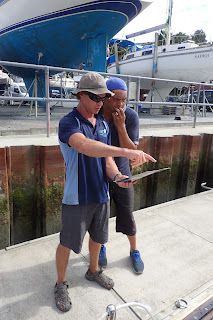 to estimate what's needed to repair our keel. 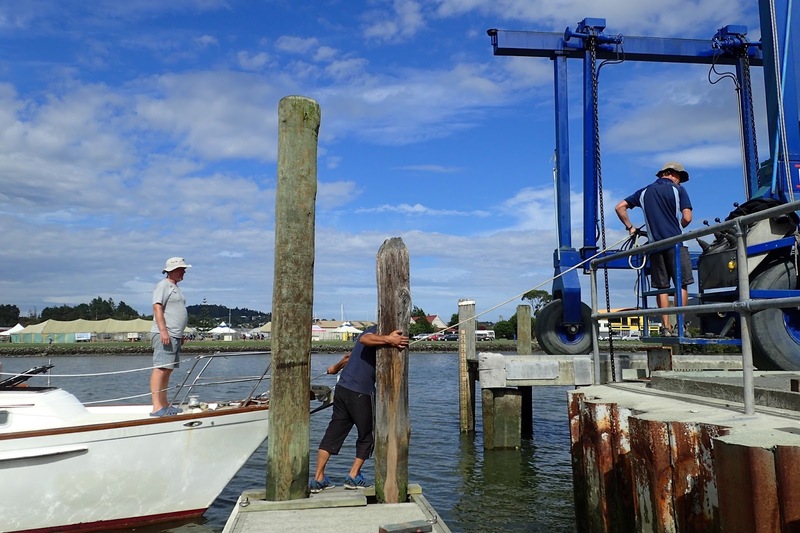 Our boat was lifted slightly again, the stand and block locations adjusted slightly for repair access and fiberglass experts from South Pacific Gateway Marina were called in. The quote? $2500-$3000 NZD "worst case." We knew from past haul-outs there were some prior owner fiberglass repairs. We just didn't know there was a problem with them. 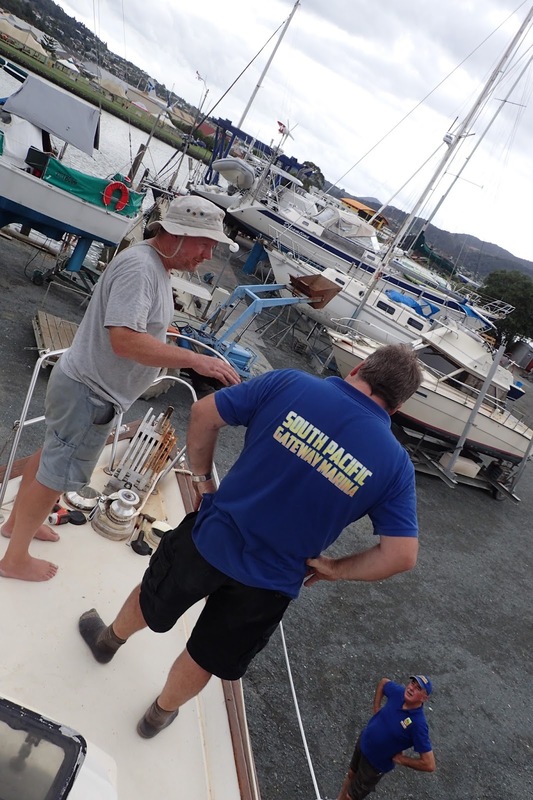 No surveyor was available when we bought the boat in St Lucia 4 years ago. If there was and we hauled-out for a survey before we bought, we're still not sure this would've been caught, though a good surveyor in theory would have caught it. Still, if it had to happen at all, it couldn't have happened in a better place. 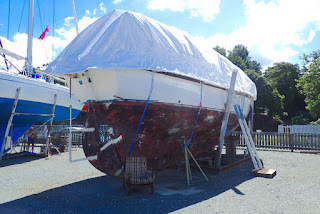 New Zealand is renowned for its quality marine workmanship. The US versus New Zealand dollar is strong - a New Zealand dollar really only costs us about 69 cents - so dollar-to-dollar, it's nearly a 1/3 discount. If we got really unlucky, it's possible if we hit rock or coral in some remote anchorage, we'd be in a whole lot of hurt getting it repaired. 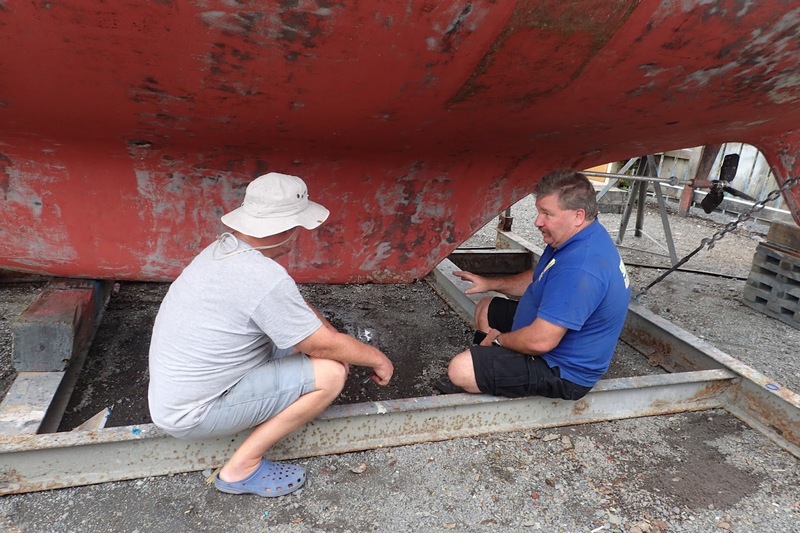 Wayne doesn't think we'd sink from it, but now that we know how badly it needed repair, it's reassuring to get it done right so it doesn't become a worry or problem. Cheap as we can be, when it comes to safety, we are loathe to cut corners. True to their word, the South Pacific Gateway Marina fiberglass folks arrived the day we hauled and called. They quoted us a schedule and thus far are keeping to it. They're very clear about what they're doing and why, so we are able to weigh in on the resolution and participate as needed. 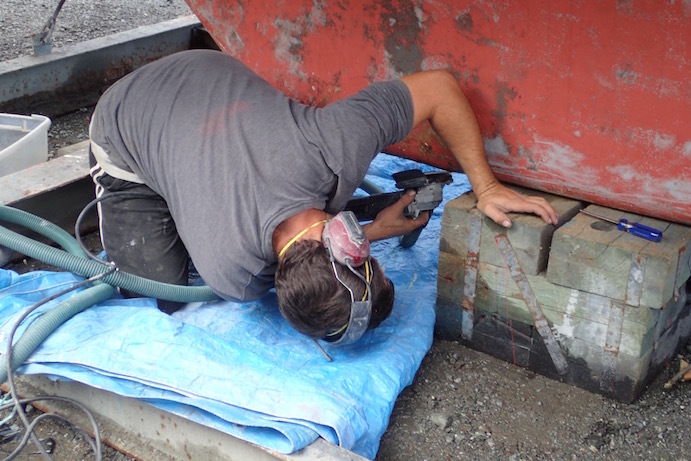 to reach underside of our Pearson keel. 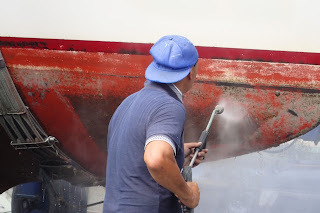 Thus, Wayne spent the better - or really, worse - part of a day using the industrial degreaser Nick, the glass guy gave us to clean out our deep, deep bilge which was draining all sorts of muck into the area that required repair. For those unfamiliar with bilges... they are basically the sewer of the boat. Dark. Slimy. Nasty, stinky, foul and malodorous. Not a fun place to muck about. was nearly big enough to stick my forearm into. fiberglass repair It was done poorly. 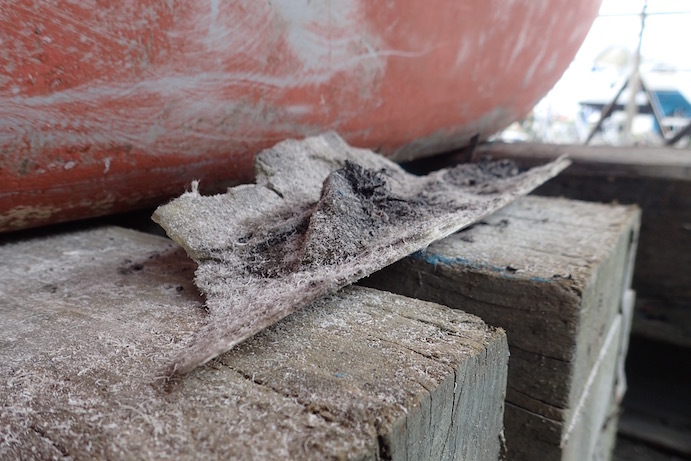 We wanted to be sure all of the rotted prior fiberglass was cleared at as well as anything contributing to the rot. 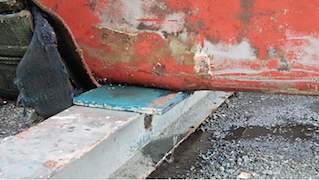 Ultimately, the keel will be repaired by glassing underneath on the outside of the keel, plus the inside of the bilge will get a layer of epoxy and vermiculite to give it more structure. That will make our bilge shallower, which given its near inaccessible depth, we consider a benefit. 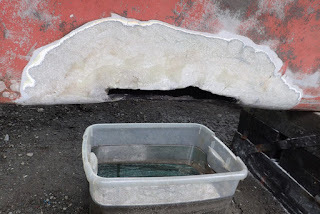 Then the fiberglass outside will be smoothed. Sizable chunk of rotted fiberglass removed from the prior repair. 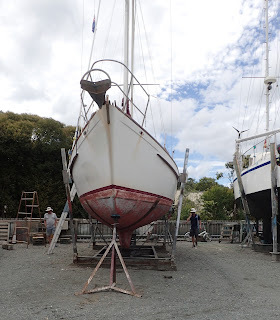 Once all that's done, we can paint and primer there repaired keel, then finally get on with the bottom job we hauled out for in the first place. We expect the whole drama will have stretched out our required haul-out time by about a week and a half. Time in the yard is money, so besides the repair, it's another couple hundred in extra fees for additional days in the yard. other cruisers for making it comfortable. Plus, we are especially grateful, even though it's yet another expense, that this time we opted to find a temporary apartment while hauled out. We were fortunate we found a place about a 5-minute drive from our boat $200 NZ (about $130 USD)/week, and it also doubles as our storage area, as to work on the boat, we took nearly everything off it. Best of all, thanks to the apartment, not only do we not have to be concerned about breathing fiberglass fumes, at the end of the day, all we need to do is some minor clean-up, then leave for a place where we can take long, hot showers and not have to climb a ladder to go to the bathroom. It's got a great kitchen, 4-burner stove, oven (which I can't quite figure out how to use), fridge/freezer, microwave, billy, toaster. The landlord even loaned us a leather couch, dresser, table, computer table, and a chair. For about $40 USD I bought a queen sized inflatable bed - another luxury compared to our pie-slice-shaped v-berth bed. When I'm too pooped to cook, there's a Chinese and a Thai take-away right below us. 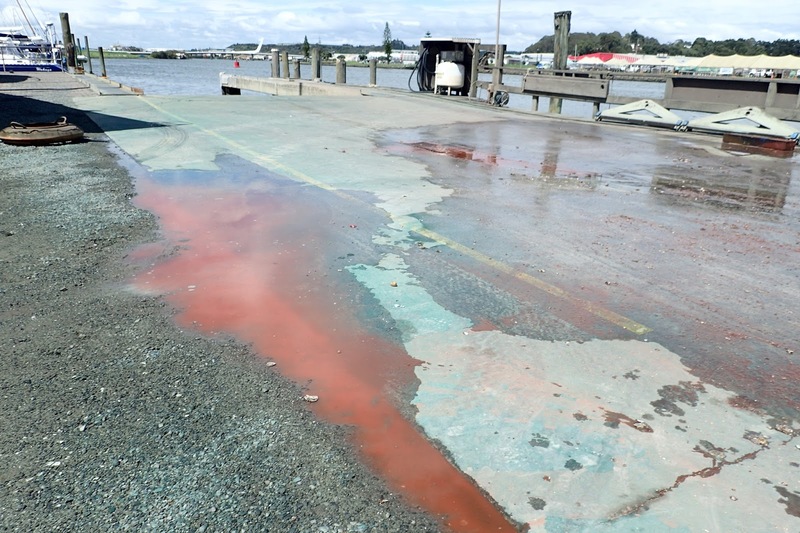 Bottom line... we'd be hard pressed to be in a better spot for serious boat repair. We're making the most of it. Our boat and we will be happier for all the work. As a few Facebook friends said... "You'll find a way to make lemonade of this." Maybe not lemonade, but G&Ts with ice from the freezer's even better! 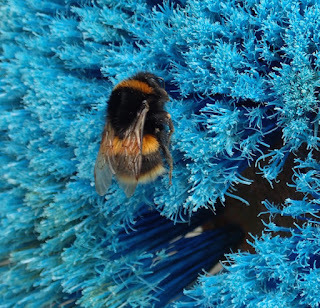 to pollinate our West Marine deck broom. Currently our boat’s in Whangarei’s Riverside Marina (S35.43.674 E174.20.17), on stilts, undergoing much major and minor work. 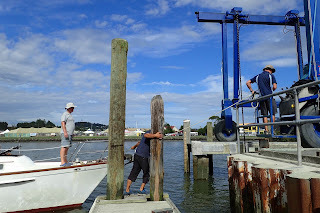 We're living in an apartment in Whangarei's Kensington neighborhood while the boat's "on the hard."